乔洪金, 胡冬雪, 胡文靖, 张燕, 王晓艳, 黄炳山, 王际英, 李宝山. 饲料中添加鼠尾藻粉对大菱鲆幼鱼生长、体成分、抗氧化和非特异免疫参数的影响[J]. 上海海洋大学学报, 2019, 28(1): 109-116. QIAO Hongjin, HU Dongxue, HU Wenjing, ZHANG Yan, WANG Xiaoyan, HUANG Bingshan, WANG Jiying, LI Baoshan. Effects of dietary Sargassum thunbergii powder on growth performance, body composition, antioxidation and non-specific immune parameters of juvenile turbot[J]. Journal of Shanghai Ocean University, 2019, 28(1): 109-116. JIMÉNEZ-ESCRIG A, GÓMEZ-ORDÓHEZ E, RUPÉREZ P. Seaweed as a source of novel nutraceuticals: sulfated polysaccharides and peptides[M]//KIM S K. Advances in Food and Nutrition Research. New York: Academic Press, 2011: 325-337. EL-TAWIL N E. Effects of green seaweeds (Ulva sp.) as feed supplements in red tilapia (Oreochromis sp.) diet on growth performance, feed utilization and body composition[J]. Journal of the Arabian Aquaculture Society, 2010, 5(2): 179-194. 卢青, 杨宁, 王正丽, 等. 饲料中添加浒苔对大菱鲆生长和非特异性免疫力的影响[J]. 青岛农业大学学报(自然科学版), 2015, 32(1): 62-66. 李红艳, 刘天红, 王璇璇, 等. 不同饲料配方中浒苔添加量对大菱鲆生长的影响[J]. 水产科学, 2016, 35(4): 334-339. LI H Y, LIU T H, WANG X X, et al. Effect of dietary green alga Enteromorpha prolifera in different formulations on growth of turbot Scophthalmus maximus[J]. Fisheries Science, 2016, 35(4): 334-339. COX S, ABU-GHANNAM N, GUPTA S. An assessment of the antioxidant and antimicrobial activity of six species of edible Irish seaweeds[J]. International Food Research Journal, 2010, 17: 205-220. NARASIMHAN M K, PAVITHRA S K, KRISHNAN V, et al. In vitro analysis of antioxidant, antimicrobial and antiproliferative activity of Enteromorpha antenna, Enteromorpha linza and Gracilaria corticata extracts[J]. Jundishapur Journal of Natural Pharmaceutical Products, 2013, 8(4): 151-159. DOI:10.5812/jjnpp. KIM S S, LEE K J. Effects of dietary kelp (Ecklonia cava) on growth and innate immunity in juvenile olive flounder Paralichthys olivaceus (Temminck et Schlegel)[J]. Aquaculture Research, 2008, 39(15): 1687-1690. KANIMOZHI S, KRISHNAVENI M, DEIVASIGMANI B, et al. Immunomo-stimulation effects of Sargassum whitti on Mugil cephalus against Pseudomonas fluorescence[J]. Journal of Current Microbiology and Applied Sciences, 2013, 2(7): 93-103. 郭中帅, 杨宁, 王正丽, 等. 大菱鲆幼鱼饲料中浒苔适宜添加量的应用研究[J]. 水产科学, 2015, 34(7): 423-427. GUO Z S, YANG N, WANG Z L, et al. Optimal dietary Enteromorpha prolifera in turbot (Scophthalmus maximus)[J]. Fisheries Science, 2015, 34(7): 423-427. CHENG A C, TU C W, CHEN Y Y, et al. The immunostimulatory effects of sodium alginate and iota-carrageenan on orange-spotted grouper Epinephelus coicoides and its resistance against Vibrio alginolyticus[J]. Fish & Shellfish Immunology, 2007, 22(3): 197-205. 吴海歌, 于超, 姚子昂, 等. 鼠尾藻营养成分分析[J]. 大连大学学报, 2008, 29(3): 84-85, 93. 姜凤梧, 张玉顺. 中国海洋药物辞典[M]. 北京: 海洋出版社, 1994: 387. JIANG F W, ZHANG Y S. Chinese dictionary of marine drugs[M]. Beijing: China Ocean Press, 1994: 387. QUEIROZ A C, PEREIRA R, DOMINGUES A F, et al. Effect of seaweed supplementation on growth performance, immune and oxidative stress responses in gilthead seabream (Sparus aurata)[C]//International Meeting on Marine Research. Peniche, 2014. LINARES F, PELETEIRO J B, LVAREZ-BLÁZQUEZ B, et al. Dietary inclusion of 10% seaweeds in Senegalese sole (Solea senegalensis) juveniles[C]//San Sebastián: Aquaculture Europe, 2014. TACON A G J. Fishmeal replacers:review of antinutrients within oilseeds and pulses-a limiting factor for the aquafeed green revolution[J]. Coniers Options Mediterraneennes, 1997, 22: 153-182. FRANCIS G, MAKKAR H P S, BECKER K. Antinutritional factors present in plant-derived alternate fish feed ingredients and their effects in fish[J]. Aquaculture, 2001, 199(3/4): 197-227. YILDIRIM Ö, ERGVN S, YAMAN S, et al. Effects of two seaweeds (Ulva lactuca and Enteromorpha linza) as a feed additive in diets on growth performance, feed utilization, and body composition of rainbow trout (Oncorhynchus mykiss)[J]. Kafkas Vniversitesi Veteriner Fakültesi Dergisi, 2009, 15(3): 455-460. HORIE Y, SUGASE K, HORIE K. Physiological differences of soluble and insoluble dietary fibre fractions of brown algae and mushrooms in pepsin activity in vitro and protein digestibility[J]. Asia Pacific Journal of Clinical Nutrition, 1995, 4(2): 251-255. 陈琴. 海藻在渔用饲料中的应用[J]. 水产养殖, 2002(6): 36-38. 纪利芹, 蒋克勇, 韩龙江, 等. 连续降温对大菱鲆成鱼代谢机能的影响[J]. 海洋科学, 2014, 38(5): 46-53. JI L Q, JIANG K Y, HAN L J, et al. Effect of continuous cooling on metabolic function of adult Scophthalmus maximus L.[J]. Marine Sciences, 2014, 38(5): 46-53. 宋晓玲, 杨绪彤, 思瀚文, 等. 双歧杆菌细胞壁肽聚糖的分离及其对二种海产动物免疫活性的影响[J]. 水产学报, 2005, 29(3): 350-355. SONG X L, YANG X T, SI H W, et al. Peptidoglycan isolation from Bifidobacterium thermophilum and its effect on immuno-enzymetic activity of Penaeus japonicus and Paralichthys olivaceus[J]. Journal of Fisheries of China, 2005, 29(3): 350-355. 王鹏, 江晓路, 江艳华, 等. 褐藻低聚糖对提高大菱鲆免疫机能的作用[J]. 海洋科学, 2006, 30(8): 6-9. Abstract: This work aimed to appraise the role of dietary seaweed Sargassum thunbergii supplementation in the growth performance, body composition, and immune responsiveness of turbot (Scophthalmus maximus). A basal diet (without supplementation) was supplemented with increasing seaweed powder content to formulate five groups of experimental diets containing 0, 2.5%, 5%, 7.5% and 10% of seaweed powder (denoted as ST0, ST2.5, ST5, ST7.5, ST10 groups). Turbot juveniles (initial weight 66.45 ±0.52 g) were fed experimental diets for 8 weeks. Results showed that weight gain rate (WGR) and specific growth rate (SGR) tended to decrease with the increasing dietary content of seaweed powder, however, there was no significant differences between ST2.5 and control group (P> 0.05), and the other groups were significantly lower than the control group (P < 0.05). The daily feed intake (DFI) showed a gradually decreasing trend, among which ST10 group was significantly lower than control group (P < 0.05). Dietary seaweed supplementation had no effect on feed conversion ratio (FCR), survival ratio (SR), viscerosomatic index (VSI) and hepatosomatic index (HSI). 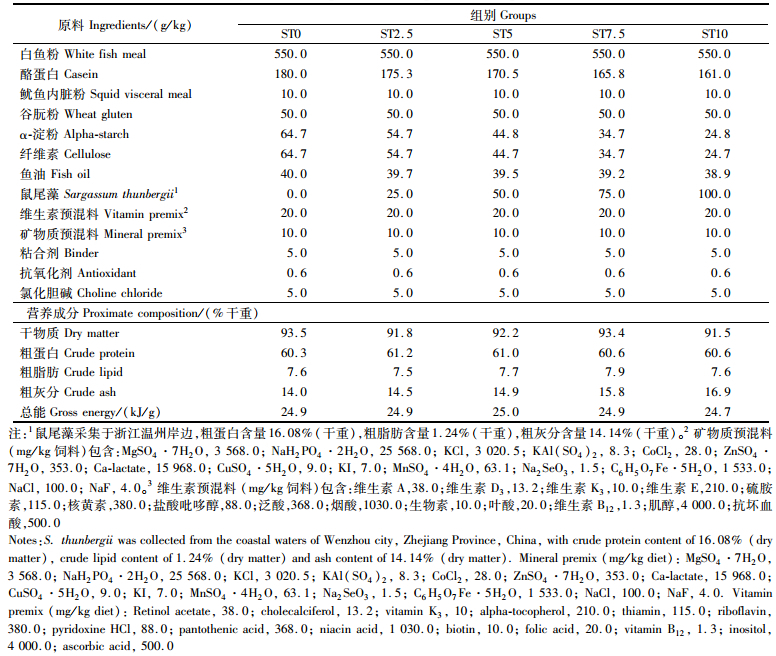 Crude protein content of whole fish tended to increase gradually, and crude fat content increased firstly and then decreased, however, both had no significant differences among groups (P> 0.05). Crude ash content increased gradually (P < 0.05), which was consistent with the trend of crude ash content of feedstuff. The concentration of serum low density lipoprotein cholesterol (LDL-C) showed a trend of first increase and then decrease (P < 0.05), and reached the highest value at ST5 group. Serum acid phosphatase (ACP) and catalase (CAT) activity increased first and then decreased, and also reached the highest value at ST5 group. Under the present experimental conditions, the addition of 2.5% S. thunbergii powder had no significant effect on juvenile turbot growth. Adding 5% S. thunbergii powder significantly increased the non-specific immune capacity of juvenile turbot.